1. 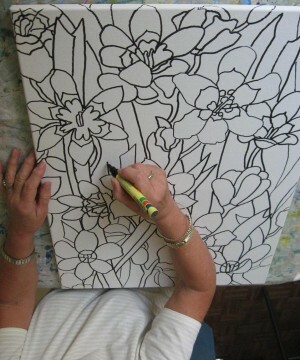 Volunteers draw lined designs in black ink on Hospital Art canvases. Designs include both simple and more complex ones (as here) to provide for a range of interests and abilities. 2. The enclosed spaces are each colour-coded so as to promote aesthetically pleasing results. 3. 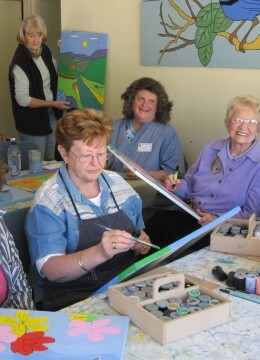 The colour-coded canvases plus paints, easels and pot-holders are supplied to each participating facility. 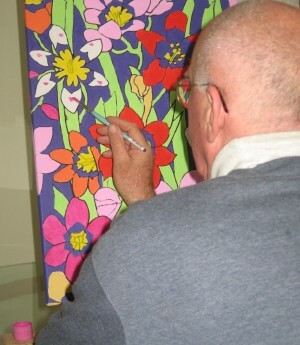 Over a period of weeks or months canvases are painted by the residents/patients. 4. 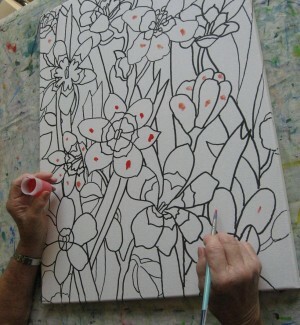 Following return of each canvas to Hospital Art, any extra work is carried out (typically including a second coat of paint and final lining). 5. 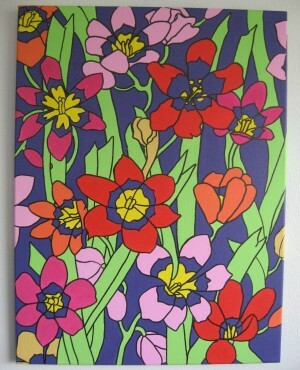 The completed paintings then go back to the facility and are hung where they can be viewed by the residents/patients who	originally painted them.